With popularity, typically comes higher housing costs – so, that’s why Redfin has been determined to find those secret hot spots in the U.S. that are desirable AND affordable. Topping the list are many neighborhoods in the Philly and Baltimore areas. The report tracks year-over-year growth in listing views, favorites and Redfin agent insights to determine which markets are growing in popularity. Redfin then matches that list to which markets have a price cap of $294,000 or under for a median home price. Here’s are the cities that top the list for 2019. Baltimore and Philadelphia dominated the top 10 list – most likely due to their vicinity to New York and Washington D.C. – which are notorious for soaring home prices. Neighborhoods in the Chicago, Portland, San Antonio and Boston also were listed. The cities who cleared the top of the list in the Baltimore area are all in what would be considered a suburb. These suburban areas – although commutable to the city – offer buyer the chance for more square footage. Experts call these buyers – move-up buyers because they’re looking for more for their money. They are also attracting home buyers because of their amenities like charter schools, adorable neighborhoods and expanded yards. 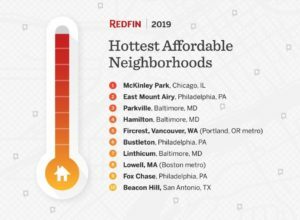 Here is the list of top five and the details that make them some of the most attractive AND affordable neighborhoods in the U.S.
For the full report, check out Redfin’s report. And, as always, give us a call once you find that perfect place to call home!